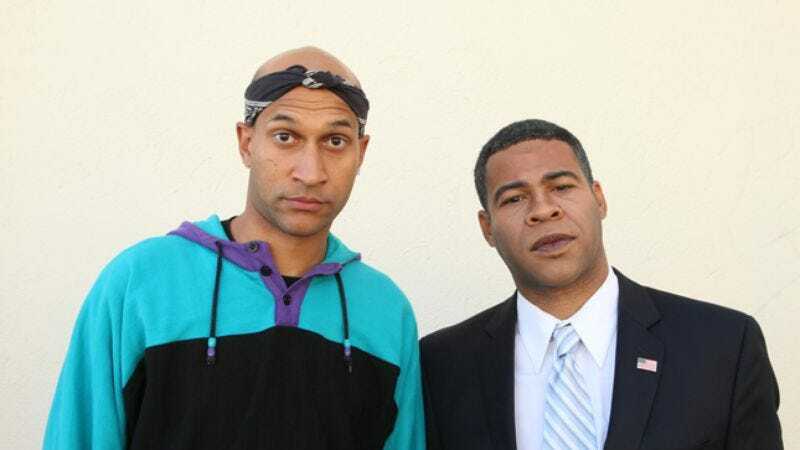 Keegan-Michael Key and Jordan Peele met while acting and writing for MADtv back in 2004. Their new Comedy Central sketch series Key & Peele has them impersonating everyone from Michael Winslow to Barack Obama, and writing sketches about Hell’s Kitchen, traffic reporters, and the black college experience. Their debut episode was the network’s most-watched premiere since 2009, and the show was quickly picked up for a second season. Key & Peele’s first season finale airs tonight at 10:30 ET on Comedy Central. The A.V. Club: Both of you were members of the long-running Fox sketch-comedy show MADtv, but the new show has a much more personal tone. In the sketch that opens the series, you’re both walking down the street, talking on your phones, and find yourselves passing in and out of each other’s earshot. Keegan-Michael Key: That may already be the most succinct description of that scene. How are you the only person who has used the word “earshot?” It’s amazing. How are you the only one who’s used that term? AVC: It’s one of the running themes in your show, that act of cultural translation. Both of you guys, being multiracial, must be comfortably fluent in that. KMK: Yeah, I think there is a cultural fluency; we’re bilingual in a way, or bi-dialectical. We just figured that there was no other way to do the show, because it’s like there’s a new comedy out there we think can be explored, and be new and hopefully innovative and something that riles the brain a little bit. KMK: Did you mean figuratively? [Laughs.] I was thinking about chopping my foot off today and seeing if it would grow back. AVC: With a lot of comedians, there was some point in their lives where they felt “outside” and comedy was the thing that they felt could get them back in. Often it’s just something simple, like they were short or skinny or something like that. JP: And you grew up in Detroit, too. JP: Yeah, that’s correct. I mean, that’s the quickest path to comedy, is facing that adversity at a young age. For me as well, it was a thing about showing emotion. I would cry if I had to cry. I was raised that emotion was a good thing. So that set me up for being picked on a little bit, but very quickly and very early, the comedy bone kicked in and took care of it. KMK: And you were quiet, Jordan. He’s a very introspective, deep-thinking kind of person, and I think sometimes it’s like, “He’s quiet. Let’s pick on him.” It’s strange. JP: It’s also the non-confrontational, cowardly when it comes to physical combat or anything like that. So, you know, as a kid… We’re barbarians when we’re kids. KMK: Yeah, it’s true. The cooperative gene hasn’t kicked in yet, so how do you navigate that part of your life? JP: There’s also real fear. As kids, there’s somehow the fear that these bullies can end your life if they want to. Everything is blown up, and occasionally that kind of awful thing does happen. But yeah, it’s a very powerful thing. AVC: What was the cultural and ethnic context in which you grew up outside of your families? KMK: Well it’s interesting. For me, as a child, I certainly thought that there were more black people in the world than white people. The way I speak, dialectically, I’ve spoken like this since I was a child, but I always just assumed there were more black people than white people. And then we drive to Illinois, and visit my family in this farming community in northern Illinois; it was this magic place. It just didn’t really occur to me until I was maybe 7 or 8, I’m like, “So I guess all the white people live in Illinois, where there are hills, and all the black people live in cities. But I live in a city and when I watch TV, those are cities, so there must be more black people than white people.” So, I lived in a city that was, when I was a kid, 85 percent black. KMK: Exactly. They lived in villages. AVC: They were like a nomadic people. KMK: Exactly, yes. Like Bedouins, really light-skinned Bedouins. KMK: [Laughs.] “Taking their horses and taking goods to each other.” And so, the cultural makeup of my city was like, 80 percent African-American. We had an African-American mayor. My father was African-American, but my father was a different type… It’s not a secret that African-American life and culture’s not a monolith, and that’s a lot to do with our show as well. So that was my makeup. I imagine, Jordan, you grew up in a more cosmopolitan place than I did. JP: New York, yeah. I was raised by my mother, my dad really wasn’t around, so I always put my upbringing into the context of Webster or Diff’rent Strokes, where it was just like, “Sometimes that happens, sometimes white moms have black kids.” I always knew she was my mom, I didn’t think I was adopted or anything. AVC: And you understood where babies come from. JP: Eventually. [Laughs.] If you have any more knowledge to answer that question, I’d be interested. KMK: It’s funny, the grade school I went to as a child was probably 60 percent white and 40 percent black, and by the time I got to eighth grade it was 98 percent black and 2 percent white, and then we had some Hispanic kids there as well. So there was a definite shift, and I felt like I was fitting in less and less and less. I found myself identifying with our gay neighbors, and our Asian neighbors, and Hispanic neighbors, and of course lots of black neighbors. But my father was a person who really didn’t enjoy a lot of noise. He wasn’t a boisterous guy. So I could see that he didn’t like that aspect of African-American culture. KMK: The noise, yeah. My dad would come to a stop sign, and then fall asleep. There’d be three other cars at the stop sign and someone would honk and he’d wake up and be like, “Go on, go on, I’m waiting for you.” [Laughs.] He was clearly the first guy at the stop sign. He was an enormous man, but not a very demonstrative man. So I really grew up with these kind of white, German grandparents who were very severe and very quiet. And the black side of my family, too. My aunts were some hip ladies, but my dad and my uncle were real quiet guys. I grew up without a lot of boisterous stuff going on, so I felt more comfortable with the white side of my family. That culture was something that my dad seemed to like, so you do what your parents do. KMK: It’s always the educated brothers that sound like that. Like, “I don’t understand where the distinction is, and please don’t say the word ‘mulatto,’ that is an antiquated term.” But the thing is, [Peele] and I voraciously love our mothers. So where do they fall in the equation? If I’m supposed to be an African-American, where does this little white woman who gave me my life—and I’m adopted, which is a whole ’nother story about sacrifice—these women did so much work, where do they fall in the equation? And I think that is something that really informs why we do our comedy the way we do it. JP: For what we are. JP: Making us a thing. KMK: Yeah, making us be a thing. So an interesting thing is, how are we not a walking embodiment of the American story? We are melting pots. Being a melting pot is what I think is great about being American, and also that we get to do something that other people don’t get to do, we get to be a hyphenate. That’s a good thing. “But why you gotta make that distinction?” Because my mother’s white, sir. Because my mother is white. And yes, I have not been given a cab. Yes, in the actual 1990s, I was in a restaurant and not served food. I’ve had these experiences that we connote as “black” experiences. And they’re negative experiences. There’s lots of positive experiences for African-Americans that I’ve experienced as well, but I will not deny this woman’s existence. I won’t do it. AVC: Jordan, you mentioned President Obama, whom you impersonated in a sketch that went viral for you guys. It’s a very loaded sketch. Let’s start with the impression of the president. I think that Bill Clinton was the first president to have an “I’m talking to white people” voice and an “I’m talking to black people” voice. But I think Barack Obama, being biracial, has earned it a little bit more. JP: Sure, sure. And you know, in his actual “white people versus black people” voice, I do hear it subtly when he’s talking to a group of African-Americans. [Does Obama impression.] “It comes in sort of a form of, uh, almost a twang to it.” He kind of channels MLK or something. KMK: Yeah, that’s exactly what it is. And his timbre changes a little bit, and his voice goes up. JP: Yeah, he always has his little smile on… He knows he’s with friends, he knows he’s with family. I almost equate it with that he lets himself be off guard a little bit. He let’s himself off of some of the presidential production because he feels familial about it. But I think it’s probably subconscious. JP: Well, he’s got to, but one of the great things about Obama is that you really get the impression that he looks past and further than race. He’s sort of consistently refused to engage in that discussion, almost as if to say, “Look man, I’m president. This is something that Martin Luther King didn’t even dream of, necessarily. So there’s a point where discussing black and white has its limits; it’s more complicated than that.” He embodies that for me. AVC: It sort of reminds me of these cultures that have third genders, where the third gender gets to do a lot of stuff that men and women don’t do. The president gets to do stuff that he couldn’t do as a white guy or as a black guy. JP: We were talking, earlier, about not existing in either world. But when we’re at our best, we’re existing in both worlds, and that is a special power in itself. KMK: That’s a good way to put it. There’s this culture and there’s this culture and this tightrope that we walk. But the tightrope itself is a culture, and that’s what we want viewers to examine and see. It’s on you, the viewer, to say, “Is it a funny scene? Or is it a decidedly black scene, or a decidedly biracial scene… Or who cares?” One of our biggest things is, are you sitting in your home alone, and laughing out loud? Are you looking at your dog and laughing out loud? Because that, to us, is a barometer worth paying attention to. … It’s that thing, I told Jordan a few months ago: My brother-in-law is a working-class guy, he frames houses in rural Michigan. He says, “I’ll tell you what, man, if I’m watching a TV show and if I get a gut laugh on that TV show, man, I’m gonna watch it next time.” Because you’re not typically watching television like they did in the ’50s, with a huge family sitting around the set. So now, it’s that situation where people are by themselves or eating a meal… I want people to say, “Oh my God, I’m laughing out loud at television.” That’s paramount to us. AVC: You guys worked together on MADtv, which was a very long-running and critically maligned television program. One of the things that I’ve learned from interviews with former cast members is that the audience at MADtv was composed substantially of actual teenagers. KMK: Oh yeah. Oh yes. AVC: I did a sketch-comedy show once for teenagers, and it’s hard! KMK: For teenagers? Oh, yeah. JP: Did you try farting? Or making a fart sound? AVC: You just have to do a lot to get to a teenager. Not because teenagers are any less bright or engaged than anyone else, they just have a lot of defenses up. And so, essentially, what you can do to get to a teenager is punch them in the face with something. JP: Or you can appeal to, ultimately, the bully in teenagers. What teenagers are ready to laugh at is the misery of other people. Safety in the herd, right? KMK: Steady diet of schadenfreude. JP: Even though MADtv didn’t pull punches when talking about celebrities and people like that, it was right for the Scott Farkuses of the world. That’s a Christmas Story reference. KMK: Oh, that’s right, yeah. I mean, it was literally the 13-year-olds, 14-year-olds. People I didn’t even think would be allowed to watch the show were big fans of the show. JP: There were a lot of things about MADtv that were inherently very difficult, and maybe ill-advised. In its inception, it was something to compete against SNL, the greatest sketch show of all time that had a 30-year head start. And so, when that’s the DNA of the show, already, it’s not Mad, it’s Cracked TV. KMK: That’s a great way to put it: it’s not Mad, it’s Cracked. Because Mad was a progenitor of SNL. It came before SNL, but that refinement that you might assume—I just said refinement and Mad magazine in the same sentence—that historical context couldn’t be used. There was no way to make it work, and so we were always competing. KMK: Yeah. They were not interested in it. They were interested in just destroying celebrities. And that was the stuff that was most popular on the show. It takes a lot of work, but if you go back and look at MADtv, there were lots of lovely sketches tucked in amongst a lot of the popular-culture stuff. And as long as we were feeding the beast, they were gonna keep making the popular-culture stuff. AVC: There’s a very funny sketch that features the two of you guys working together as a pair of guys obsessed with good luck and hexes and gambling. AVC: Each round of gambling was interspersed with a complex stepping routine, complicated dance sequences that involved a lot of high-fives. I was so exhausted watching it. JP: Oh man, we killed ourselves on that one. KMK: We destroyed ourselves doing that. That one was harder than the first one. AVC: It was really funny, but all I could think of was you trying to get those teenagers to keep laughing. KMK: That they’re idiots if they don’t love it. JP: So what he’s used to, and what I’m used to, too, is rehearsing, and just really getting something down. KMK: Rehearsing. Long and hard, yep. JP: So that was something that we knew, if we presented it at the table, everyone would be thrilled; you’d have to pick that sketch. AVC: Did you dance at the table read? KMK: Oh yeah, at the pitch. At the table read, we did the whole scene. With the dancing. KMK: And for some reason, at that time, you were very interested in step dancing. It was before Stomp The Yard came out. AVC: Well, it is very interesting. JP: Well, that’s the other little cheat, and that’s what we do, we try to ensure ourselves for a certain amount of success. And that’s the cheat there. We know it’s something we could pull off and we know that watching step dancing is just inspiring, amazing, it fills you with something special. So if we can pull that off, and get a laugh? Boom. It’s a sketch that’s got legs. KMK: Yeah. It’s just hustling. We feel like if you work hard enough, at the very least, they’re going to appreciate the effort. [Laughs.] At the very least. But then, we wanted to make sure it was also hilarious. JP: I mean, certainly there was part of that. We had Aries Spears, Keegan, and myself. And Daniele Gaither. That’s four black people, and in my calculation, that was way too many for a sketch show on television. JP: I’m racist to my core, so I as far as I’m concerned, no. That is unacceptable. No, but yeah, I figured, “How long can this last? Really? JP: So I latched on to him. I also wrote something with Nicole Parker, a hilarious white friend of ours. To be honest, I didn’t write that with Keegan specifically because he was black, but moreover because he and Nicole had very much congealed themselves on the show just through their talent. And I think my writing style is very offbeat, and so I would throw a lot of sketches at them and they just wouldn’t make it past the first level. AVC: I think I’m getting the time period correct there. KMK: If not, you’re maybe a year off. But no, it was, “There’s no Justin Guarini in that sketch” when I first got there. So working with those two people specifically—they were people that I knew, were on the same page as me—we could do something that was actually great, valid, funny, but would also satisfy what MADtv needed as far as spectacle. AVC: One of the things that was different about MADtv relative to, say, Saturday Night Live, is that one of the groups of people deciding what sketches got onto the air was non-creative people. On Saturday Night Live, it’s ultimately the head writers and Lorne Michaels. On MADtv, a significant portion of who’s deciding what sketches get onto the air is Fox executives or non-creative executives. KMK: We had show runners who were terribly creative people. Wonderfully creative people. JP: Yeah. We had some producers who were really the glue that made it work at all. And it did work as far as, certainly, the people creating the show. AVC: You should explain that you’re a reverse racist: You’re racist against non-black people. KMK: [Laughs.] Yes, I’m racist against non-black people. But you’re right, what you did, having to have all those ingredients, our show runners were really deft at that. But also, those little precious gems that got tucked into the show were because of those guys. AVC: On Key & Peele, it really is your voice entirely. That must be both very exciting and maybe a little bit scary. KMK: Oh yeah. We’ve talked about it, it’s like, if you don’t like something, or you’re offended, or you think it’s lackluster or something’s arbitrary, it is our doing. That’s the thing. MADtv was easy; there’s a million people there. You can blame anybody else but yourself. Anybody you wanted to, you could blame. You could blame booking, or anybody. It’s a little scary. It’s our brand, and it is our responsibility. Because, trust me, if a show didn’t work and I were an executive, I would throw you under the bus, too. It’s your material, and I gotta feed my family, I need to keep my job. So it’s us. It is us.